Society tends to blame the failure to lose weight on lack of willpower, but the truth is much more complicated than that. In New York Times article, “Why Weight Loss Surgery Works When Diets Don’t”, Dr. Twells, a clinical epidemiologist, explains that “the overwhelming majority of patients who undergo bariatric surgery have spent many years trying – and failing – to lose weight and keep it off. And the reason is not lack of willpower.” The only consistently successful weight-loss method for morbidly obese people (those with a BMI over 40) has been bariatric surgery. Without undergoing surgery morbid obesity is very difficult to cure. While weight loss can be the ultimate goal for some patients, let’s talk about the metabolic benefits. “For the two most popular surgical techniques – the gastric bypass and the gastric sleeve – the metabolic benefits are independent of weight loss.” Moreover, according to findings at the Cleveland Clinic, for the small percentage of patients who lose less weight than most after surgery, significant metabolic benefits persist. Benefits include increased blood circulation, reduced toxins in the body, a more positive mood, and an increase in overall energy. Even more importantly, studies are now showing an extremely positive impact for patients with Type II diabetes, with weight loss surgery often leading to a significant reduction in insulin requirements, or better yet, a complete cure! To conclude, Dr. Jon C. Gould, a surgeon at the Medical College of Wisconsin in Milwaukee, stated that “bariatric surgery is vastly underutilized, less than 1 percent [of people] who would qualify for bariatric surgery are actually getting it.” There is a perception that bariatric surgery is dangerous and doesn’t work, but this is countered by extensive research on long term results following surgery. While many experts would agree that money would be better spent of prevention than treatment, Dr. Twells pointed out that “we have yet to find a way to prevent obesity, and people whose health is compromised by their weight deserve to be treated by the most effective method we have.” Bariatric surgery is not a cop out and failure to lose weight is not lack of willpower. 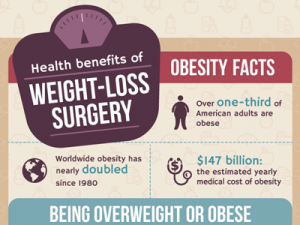 Bariatric surgery is an effective means to end your struggle to lose weight. Leahey, Helen.”Resolving to Lose Weight This Year? Willpower Isn’t Your Biggest Obstacle.” The Washington Post, January 1, 2015. Brody, Jane. “Why Weight Loss Surgery Works When Diets Don’t” The New York Times, February 13, 2017.